Alex Ovechkin is continuing his great work as an ambassador with the American Special Hockey Association by offering up a pair of his autographed of one-of-a-kind skates. Alex Ovechkin is continuing his great work as an ambassador with the American Special Hockey Association by offering up a unique item for auction. After lacing up a pair of Russian-American themed Bauer Vapor 1X skates during the Washington Capitals’ pregame warmup on March 23, Ovechkin will autograph the pair which will be auctioned off with all proceeds going to ASHA. Some may remember Ovechkin’s first skating event as an ASHA ambassador in 2014, where then 11-year-old with Ann Schaab of the Washington Ice Dogs fearlessly asked the captain to go on a sushi date. Since 2014, Ovechkin has hosted three ASHA skating events, donated a car to ASHA following the 2015 NHL All-Star Game in Columbus, and received the 2016 ASHA Inspiration Award. ASHA exists to give kids of all abilities the opportunity to learn and grow by playing hockey. There are over 50 ASHA programs in more than 30 cities across the United States. 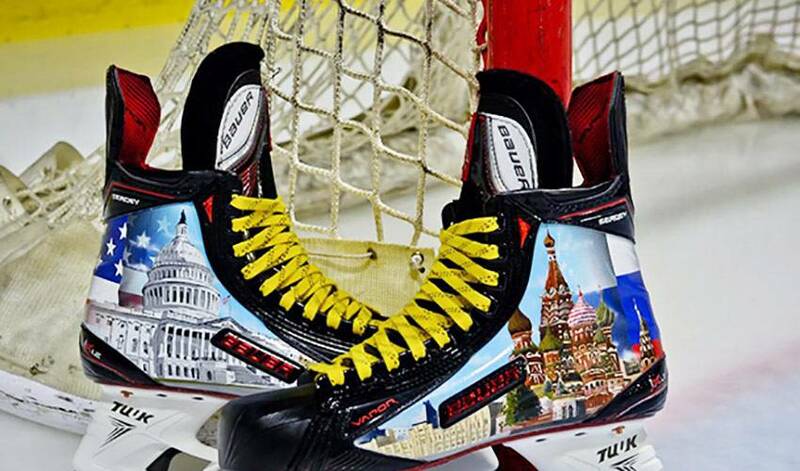 The skates, featuring Moscow’s St. Basil’s Cathedral and Washington D.C.’s Capitol, were designed by shoe artists Nick Avery and Polo Kerber. The auction closes at the end of the second intermission of the Capitals’ game on March 25. For the full story, visit NHL.com.